The British National Party has lost many of the seats it held on local councils in England. After 270 council election results, the anti-immigration party won two seats but with a net loss of 11 councillors. The BNP lost all five of its seats in Stoke-on-Trent, where it launched its election campaign in England, and one of its two councillors in Burnley. BNP candidates finished ahead of Liberal Democrats in four seats in the Welsh Assembly, but failed to win any. Before the vote, party leader Nick Griffin said he was confident a candidate would reach the 7% needed to gain a seat, but none reached the threshold. In Stoke-on-Trent the wards previously held by the BNP were all subject to boundary changes, and due to those changes there were 16 fewer seats available. The party, which had two MEPs elected in 2009, lost almost half its council seats in last year's local elections, losing all 12 of its seats on east London's Barking and Dagenham Council. As well as elections in England, the BNP also fielded 32 candidates for the Scottish parliament and candidates for the assemblies in Wales and Northern Ireland. However, the party had to rein back on its campaign spending with debts of more than £500,000, which it has said it expects to pay off by the end of the year. The BNP has been hit by internal divisions and was facing doubts over its future after costly court cases brought against it including one by the Equality and Human Rights Commission. The party has said it will not be incurring any more debts as a result of Thursday's elections. 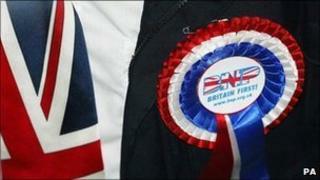 The BNP contested 338 seats in the 2010 general election and lost its deposit in 266 of them.